กินและครื้นเครง "Eat and be merry"
Heat oil in pan and saute onion, carrots, zucchini and corn. Add fish oil and sesame oil. Gently fold in rice and soy sauce. You can garnish with chopped green onion. Mix coconut milk, orange juice, sesame oil, miso paste and add in green onions. Place salmon in a glass baking dish and pour marinade over fish. Marinate 2-3 hours. Bake with the marinade on for 45 minutes at 375 degrees. 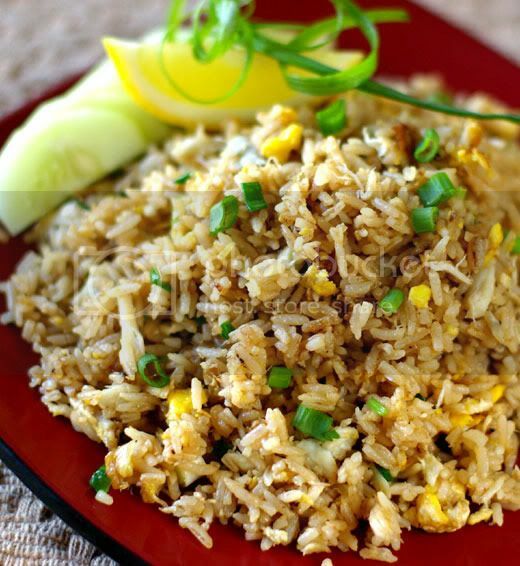 Serve with Jasmine rice and spoon marinade over rice and fish. Yum! Simmer water and throw in spinach. Blanch for 30 sec. and immediately cool off in a bowl of ice water. For the sauce, heat Oil in pan or wok and heat curry paste. Mix in coconut milk and peanut butter. Boil the chicken. Serve by placing spinach then chicken then sauce on a bed of jasmine rice. Preheat oven to 375 degrees. Grind peanuts in food processor. Combine peanuts, garlic and ginger. Place chicken on a baking sheet and squeeze lime on top. Roll in peanut mixture and bake for 25-30 min. Spray pan with cooking spray and cook garlic and ginger over medium heat until slightly browned. Add sesame oil, then add steak and cook until browned on each side, and cooked through. Add bok choy, salt/pepper and cook until bok choy is soft. Mix mirin and sugar together in bowl and pour over meat/veggies. Serves about 3-4 oz meat per person with 1/2 cup rice and as much bok choy as you want! add different veggies like broccoli or carrots. this is a great stir-fry type recipe. Place chicken cut side down in a 9x13 inch baking dish. In a medium mixing bowl, combine sugar, soy sauce, grated ginger and garlic. Mix well, and pour mixture over chicken. Cover and refrigerate for at least 3 hours. Preheat oven to 375 Bake chicken uncovered in the preheated oven for 35-45 minutes, basting frequently. Test for doneness, making sure there is no pink left in the meat. Let cool slightly, then cut into smaller pieces to serve. Heat butter in a wok or large heavy skillet. Saute chicken until browned. Remove, and set aside. and cook for 5 minutes. Add softened noodles, and vinegar, fish sauce, sugar and red pepper. Adjust seasonings to taste. Mix while cooking, until noodles are tender. Add bean sprouts, and mix for 3 minutes.